Hi! 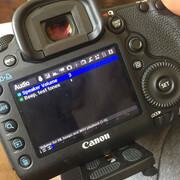 I downloaded the last version of Magic Lantern, but the only thing that shows on the audio menu is "speaker volume" and "beep, test volume". I would like to change the mic power and the analogic gain, among other functions. Anyone knows what I have to do? I added the image to help.